The latest somewhat indecipherable Transport for London (TfL) budget, says that its £1bn budget deficit is coming down. The operating deficit of £968m in 2018/19 is now forecast to be almost halved to £500m by the end of 2018/19. The shortfall is down to a number of things including a cut to the government grant, London Mayor Sadiq Khan's partial fare freeze, a fall in passenger numbers and the delay to Crossrail. But the deficit reduction will not be good news for everyone. To wipe out the "overdraft" there have been cuts - and there is little sign they are stopping. What's to blame for a fall in passenger numbers? There will be 30% cuts to middle and backroom staff. In 2019, that is a saving of £211m. 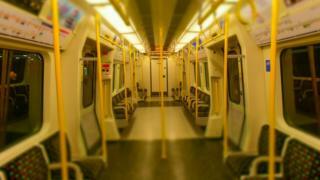 Human resources and finance functions will be merged, while maintenance on London Underground will be "modernised". Also the bus network will be "reshaped". What they mean in plain English is cuts. The number of bus passengers continues to decline. TfL says: "The operating deficit on buses will be £722m in 2019/20, which is the highest bus subsidy in our history." In response, TfL is moving buses from the centre to outer London, but overall mileage will also come down. Tube passengers though have started to return and have increased by 0.8%. But what is interesting here is because of the fares freeze the amount of passenger income gained from that is not as high as it would have been if fares had been pegged to inflation (or inflation plus 1%). And absolutely crucially, total forecast income for 2018/19 is £6.66 bn. That is actually lower than income in 2015 (£6.7bn) and 2016 (£6.76bn). And that is with £305m from charges from the Ultra Low Emission Zone (uLEZ) charge. The number of cycling journeys in central London is at record levels. The whole document is overshadowed by grim warnings about the state of the economy and the shadow of Brexit uncertainty looms large over all of these forecasts. Tony Travers, from the London School of Economics, says: "Behind the upbeat headlines, TfL finances are still on a knife edge." What’s to blame for a fall in passenger numbers?